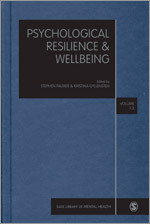 SAGE are preparing a new academic work, Psychological Resilience & Wellbeing, edited by Stephen Palmer and Kristina Gyllensten, Centre for Stress Management in London, which will be published next month (July 2015) as of the SAGE Library in Mental Health. Apparently, this work will be printed in three volumes with an introduction by the Editors. Our paper on evaluating organisational-level work stress interventions: beyond traditional methods is to be included. This paper was first published in Work & Stress in 2007 (21, 348-362). Without knowing the context of its publication, we are, at this point, somewhat flattered. This entry was posted in Uncategorized and tagged Amanda Griffiths, Beyond traditional methods, Centre for Stress Management, Evaluation, Kristina Gyllensten, Mental health, Organisational-level stress interventions, Psychological resilience, Stephen Palmer, Stress, Tom Cox, Wellbeing. Bookmark the permalink.